Q: Are Auraology photos the same as aura polaroids? A: Yes, because it is the same biofeedback apparatus that creates a color interpretation of your aura. No, because it is a digital image which is created with an Aura Imaging software that produces both photos and videos instantly. Due to the digital technology, there is minor pixelization in the prints as opposed to the polaroid image you may have seen in the past. Essentially, it is an older technology so although it is not as crisp as your iPhone X, the aura photos produced by our program are still sharp and (most importantly) accurate depictions of your auric field. 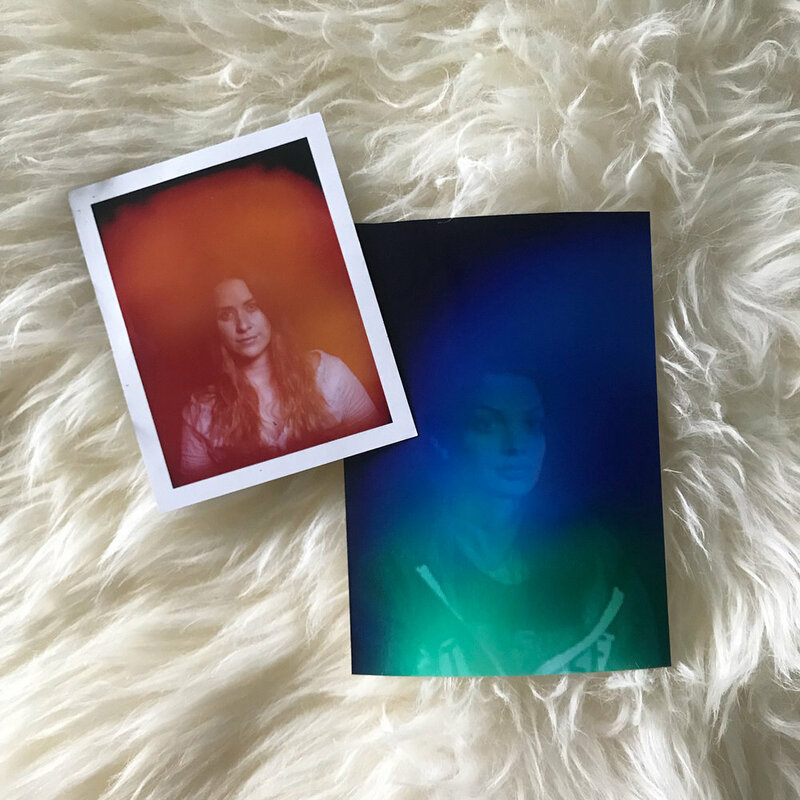 You will receive a frame ready 4x6 instant print of your aura as well as an in-depth reading about your current auric state. If you have an animated aura session, you will receive a link to download your custom video via email shortly after the session. Q: What is an aura photo and how does it work? A: The camera we use is classified as a biofeedback apparatus. The technology produces an electronic interpretation of what we believe the Aura would look like. It does not photograph the actual Aura. There is nothing that exists that photographs a real aura but this interpretation is as close as it gets! The energy you emit is measured by a hand plate measures the client's electromagnetic field by monitoring acupressure points that correspond to energy channels in the body called meridians. The energy is then converted to frequencies that match certain colors. Through metaphysics, color theory and people that can see auras, each color has been assigned attributes. A: The creator of this machine, Guy Coggins, has corroborated with many psychics during the evolution of this equipment. Therefore the camera has been developed to match the same colors seen by aura-reading psychics. The colors seen by the human eye are usually less vivid than those seen by the camera. (They're usually on the pastel side.) On our equipment, the colors have been amplified so there is more defined differentiation between frequencies. Q: Can you use the camera for diagnosis? A: No, it is a non-medical device. It is designed to diagnose a level of spiritual energy. It can be helpful to take before and after photos so measure energetic differences caused by certain treatments, practices and other healing modalities. Q: Who decided what the colors mean? A: The inventor of the biofeedback Aura Imaging devices, Guy Coggins, based his color interpretations on different electrical measurements. Each color has its corresponding electrical frequency which can be measured. Coggins was also inspired by the writings and teaching of Dr. Max Luscher who has done extensive research on color preference and personality. Author of The Luscher Color Test, he was well known during the late 1960's and was a contemporary of Sigmund Freud. So you got your Animated Aura Email... Now what?? No worries! We have all the download instructions here. Click on the designated Aura photo in your email. Your personal URL will lead you to a downloadable Dropbox file. CLICK on the three dots on the top right of the window. CLICK on the option to EXPORT. SHARE to your Instagram & Facebook! My friend had her aura read and the photo was so stunning. I went to the Modern Witches Confluence, but was unable to get my photo taken. I was informed that there would be an opportunity in Oakland, at Girl Gang Craft, and I immediately signed up. I am so glad I did! My aura reading brought me to tears! I was so happy to be receiving so much information about what I am emitting to the world! I have been setting some intentions, based off this reading, and I couldn't be happier. This experience was awesome and I recommend it for anyone who wants to see their own magic. I LOVED my aura reading and animated photography. I left with a still, a better understanding of my aura and what I’m emitting, and of course I couldn’t pass up the animated GIF option (and you shouldn’t, either!) The lightworker-slash-photog is truly a modern mystic: so accessible and cool. I would recommend Auraology to all my friends. Let me just start by saying I will be forever thankful and grateful for this experience. I've wanted to get my aura photographed for a while now, so I was so excited when I saw Auraology was coming to Atlanta. A few months ago I saw a post from a girl who brought her cat with her for her photo. I thought it was the coolest idea, so I was going to ask to bring my dog, who has been my absolute best friend for 11 years. Tragically, my dog passed very unexpectedly a week and a half before the event. I was so devastated about losing her that I almost didn't go, but I decided that I would and bring her ashes instead. The lightworker was so beyond kind. She took a photo of my aura without Gwenivere's ashes, then another when I was holding Gwenivere's ashes. The aruas were vastly different. In the photograph where I was holding Gwenivere's ashes, there is a striking white light through the aura. She said that meant that she is still with me, protecting me. The photos and animation are something I will cherish forever. It really gave me such a sense of peace and wellbeing. The lightworker was so kind and empathetic, I can honestly not be more thankful. It was truly a magical experience.